Just north of downtown, Zurich Airport is a popular gateway home to three small terminals conveniently connected to railway and bus stations. From the historic architecture of Old Town to renown waterfront promenades hiding around downtown corners, the seaside city is one of Europe’s most beautiful to get lost in. Take advantage of hotel shuttles by booking a room nearby, whether it’s from the on-site Radisson Blu Hotel Zurich Airport or Park Inn across the street. You can get even more out of the day by getting a private ride. From the shops in District 1 to scenic roads along Lake Zurich, getting a ride to explore the Swiss haven makes everything sweeter. Whether you’re looking forward to an afternoon at MFO Park of work or an evening of elegance around town hall, a private sedan can take you far in Zurich, even further if you’ve got an open mind. You can also take advantage of the meet-and-greet services of a local personal driver get from point A to point B with exclusive advice, not to mention swift taxis for ultimate convenience. Families looking to check out diverse landmarks ranging from Zoo Zurich to the beautiful crafts at Swiss National Museum should get a ride that makes transportation just as fun, whether it’s a comfy SUV or spacious chartered bus. Find other destinations that offer GO Airport Shuttle or search for other transportation providers at Zurich (ZRH) airport. Some of the providers of reliable, safe, and world-class shuttle services in Zurich International are Super Shuttle, GO Airport Shuttle and Carmel Car and Limo. Zurich’s Old Town and Fraumünster Church are sightseeing sites not to be missed. Our shared van service is excellent ground transportation with great discounts when traveling alone or with a group. It is highly worthwhile taking a tour with your family to Lucerne, the most charming Switzerland city. Once there you can plan to visit Lion Monument, Kopellbrücke Transport Museum and Rosengart Museum. We highly recommend this transport offering door-to-door service, airport transportation upon arrival and departure. You can spoil yourself booking our private sedan and you can surrender yourself to chocolate cravings at the official Lindt chocolate shop, located at Zurich West district. Your personal driver is trained for on time pickup and drop off. Hire our local drivers to take you at the forests surrounding Zurich where you can find many places to enjoy Swiss cheese fondue. You might take all day long shopping attire at the world-renowned Bohnhofstrasse shopping boulevard. Our private SUV drivers are reachable at just one dial. Our professional taxicab drivers know very well the access to a medieval picturesque town -Altstodt- with many museums. You can book our limousine services for airport transfers and you can book it for enjoying an elegant and classy ride to the Zurich Opera House (Zuricher Opernhaus). Our bus service can take you for a tour at Rhine Falls. While hiking you will be marveled with the stunning scenery of the natural worlds. Find the information you need when you fly into Zurich airport and need a little help guiding you towards your driver to be picked up. Zurich is the largest city in Switzerland and is also the financial center of the country and home to the Swiss Stock Exchange. While you are in Zurich make sure to go and see Grossmunster, a beautiful old Romanesque church. No matter your budget and your tastes, you will find a good hotel close to the Zurich International that will meet your airport shuttle hotel in Zurich needs. Many hotels are located close to this magnificent Swiss airport to cater for the accommodation needs of travelers. Some of the popular hotel shuttles sited close to the Zurich International Radisson Blu Zurich Hotel and Movenpick Zurich Hotel for shared ride and private van and sedan service. Zurich Kloten Airport, which has an IATA code of ZRH airport, is a very large airport. 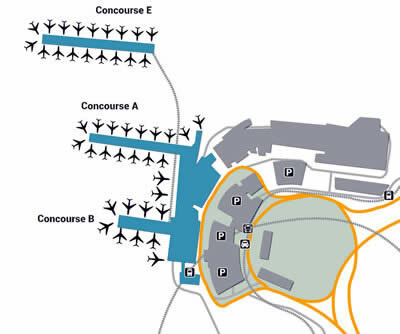 It has 3 terminals (Terminals A, B, and E) and 3 runways. While runway 14 is mostly use for landings, runways 16 and 10 are often used for takeoffs. Over 70 airlines fly from Zurich International Airport to more than 180 destinations all over the world. Switzerland is one of the financial hubs in the world. As Zurich is the financial center of Switzerland, it hosts a lot of the major players in the world’s financial sector. A lot of business deals are conducted in Zurich. Thus, Zurich International Airport is one of the busiest airports in the world. It is the 12th busiest airport in Europe. This airport caters for an average of 22 million passengers annually. Flughafen Zurich AG is the owner of Zurich International Airport. This company is listed on the Swiss Stock Exchange. The City of Zurich and the Canton of Zurich are major shareholders in Flughafen Zurich AG. The welfare of passengers arriving and departing this splendid Swiss airport is of utmost importance to the owners of this airport. Zurich International Airport is one of the best airports in the world. This amazing Swiss airport is a multiple winner of the prestigious World Traveler and Business Traveler Award. Some of the facilities in this airport include airline check-in areas, railway station, a bus terminal and a tram terminal. Zurich International Airport is renowned as a shopping paradise. This fantastic Swiss airport offers passengers duty-free shopping. Passengers do not have to pay Value Added Tax (VAT) on goods bought at this airport. This means that passengers can buy perfumes, alcohol, tobacco and other goods at an extremely low price at Zurich International Airport. If you are looking for a world-class art museum visit Kunsthaus which features art by renowned Swiss artists. If you are looking for transportation to and from your hotel and Zurich Airport or ZRH try one of our private cars or shared ride vans.